I run a charity organization called Elderly and the poor, a self-sponsored charity organization. Jim Iyke needed help for his aged mother who is crippled by leg problems and high blood pressure and now bed-ridden. We took her to both England and India — photos and tickets are attached as exhibit (1). During the UK visit, his mum stayed with me in my UK residence where I took her for a complete health checkup. We were told what was wrong with her and how much her hospital stay for knee replacement will cost my charity in UK and we have a policy for money, so we decided to take her to India in first class because it’ll be cheaper there, attached are tickets, photos as exhibit no (2). I was touched. I was obliged by her honesty, frankness, and trust she has in me, so I promised her that I will be there for her and her children, which includes Jim Iyke. So when her son Jim Iyke finally ran to me for assistance, wanting me to help his new clothing line grow by investing in it, I had no option than to invest, even though I was told by many people that he is bad, but I didn’t want to judge him by what others said. Jim told me he has been on the street since age 11 and that he had no childhood. I cried, because I had a son of that age at that minute. It was really heart breaking. But I realize now that you can take a person off the street but you can’t take street off the person, no matter what you do. Video of our conversations with his mum is available at www.elderlyandthepoor.org, register and listen. Normal human being would remain very grateful to me for helping his whole family and investing in his business. If not for what I did for him but for the fact that her sick mother and a blind father were flown abroad at some my expense, including three of his sisters and him. During these trips he happily tweeted, “Jim Iyke on holidays with my family”…can you see the joy in his tweets? At least his tweets proved that I made him and his family very happy. So I’m not bothered by anything he says or does now. My investment in his clothing line has now turn into loan, no interest, no profit and I’m stuck with him for 4 years — since the agreement states that he must paid all the money back with the next four years. In the north, if a person just passes by your dad or mom and just greats them that person deserves your respect, but after what I did for Jim and his family, it’s sad that he decided it this way. Another thing I want to add for clearance sake is that Jim has been living off women all his life. Most of these women don’t tell their husbands all they do, so when he dupes them they can’t run to the police or their husband, but my case was different. I arranged for a meeting between him, his friend Solo and my husband (for video of the meeting, go www.elderlyandthepoor.org. Where are the camouflage women he hangs out with just to disguise his real wants and needs. He runs to tweet rubbish. I give facts and support with documents. He wants to shut me up with his so-called “shout out” that made no sense to even his twitter followers who fired him back that same night. He wants me quiet so he can continue business as usual. Everybody doing business with Jim Iyke be careful, his first trick goes, bring the money cash, I will send my sister or PA to pick it, don’t. Because it was only the tellers that I used to pay in the money into his account that helped me, because he first denied collecting the money and even knowing me. The Police ordered that he be handcuffed and be taken to his bank to collect his bank statement for us, it was only then that he said, “Oh it could be one woman who is interested in me and I don’t like her, may be her, in fact, I can’t even remember her name.” (a woman that gave you N16.5mil you can’t remember her name?) Later he changed his story again that the woman gave him only N5m. See how police arrested him and wrote to his bank, exhibit no (3). All he is playing is to keep business as usual including his manager, because it’s only in Nigeria that celebrities can commit crimes and go scot free. Abroad nobody will work with you, once your attitude is below expectation. Jim is supposed to be a role model by every standard. At 40 years old, he’s no longer a baby, but he is not showing any maturity in his dealings. Was there any place Jim ever denied apologizing? No, he was just covering it up by saying I apologized as a gentleman because of the bad words I said. What bad words and to whom? In fact, he wrote a public apology twice because the first one he said To Whom It May Concern which was rejected after publication, see attached exhibit no (4). It was rejected, because we expect he knows whom he was apologizing to, and not to whom it may concern. So he ran with the last one apology to me. Do you think Jim who is running mouth now will apologize if he didn’t know he was on his way to jail? See attached hospital reports after his assault on me, exhibit no (5). Fraud was very clear and substantiated, because he went and rented a three bedroom bungalow with one living room and he calls that mall. To show he planned to defraud me, he rented the place in someone else’s name. The person signed as his guarantor at the police station after he was arrested and spent two days in SAS. I was shocked when I learnt that Jim told Mr Ken that he will not pay me the money, and that that was why he won’t put anything in his name. So that when I come, I won’t be able to get anything. The guarantor got scared and ran back to the police by withdrew from standing in for Jim, which necessitated his second arrest a day to the opening of the shop. See evidence attached as exhibit no (6) Be careful in doing business with Jim Iyke and demand a teller or a written contract, because he only signed that contract between us when he saw tea no bi food. He was discharge and not acquitted. naija! this kind of mug-shot in 2012? As a psychologist & from the vituperation of this Hajia Habiba, it is obvious that Jim Iyke was F**king her all the while they had the good understanding & relationship. It was because of this 'good understanding & relationship' that made her dole out N16.5m to Jim Iyke. Things assumed this dimension when she started noticing that Jim Iyke may back out & also towards the end of it all, she wasn't getting the romance & humility she expected from Jim Iyke. All these are efforts to get back at Jim Iyke. If Jim Iyke had continued to cooperate with the sexual relationship with the desired humility & cordiality, all these wouldn't have happened! Forget Hajia's posturing that she carried her husband along all this while, that is a big lie, she also brought her husband into the picture & arranged the "Sting" Video Operation when she started suspecting Jim Iyke's uncooperative moves towards her insatiable sexual desires. 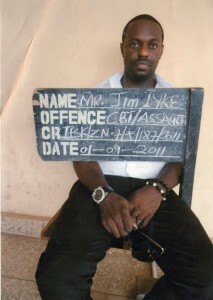 She thought she could keep Jim Iyke glued to her insatiable sexual desires by doling out N16.5m along with other offers. Hajia still feels emotionally bruised, cheated, used & humiliated that is why any action of Jim Iyke still pains her so much, including Jim Iyke's blogs. I know these Abuja, Lagos, PortHarcourt & Kaduna 'rich' women who can do anything to keep the 'honey stick' between young men's legs coming. Its bad for both of them!!!!!!!!!! !